This is the LEGO set that nerds like me have been waiting for. 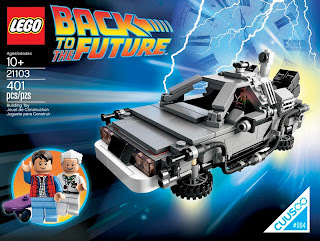 Through their Cussoo program, LEGO has released the DeLorean Time Machine from Back to the Future. The set was released at this year's Comic Con in San Diego. To no surprise, the sets were sold out within minutes. Luck for us who did not make it, or were too lazy to head down to San Diego, the set is available at 'select retailers' and at LEGO for $34.99. Anticipating the rate that these are selling, I ordered mine through LEGO. These are currently sold out everywhere, typical wait is about 30 days. You can always pay more at an online auction site or just order and wait a few weeks for delivery. The set is pretty much what you would expect from LEGO. 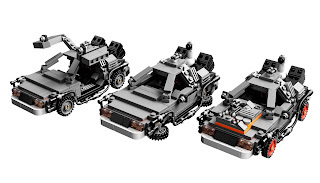 Although, the prototype and other fan made Time Machines are more 'accurate', this set is great at the price point and for the general consumer. One of the highlights is the set comes with pieces to make three versions of the Time Machine as seen in the Back to the Future Trilogy. Notice I said "three versions" and not "all three versions". Why? Because there are at five versions of the Time Machine from the movies. The set is fairly easy to build with easy to follow directions. It is graded for 10+, but you know and I know, that if you are giving this to a kid, you end up building it yourself. Oh, kids these days and their video games. The build should take about an hour. It took me about two hours, but I like to line up the "LEGO" on the studs so they face the same direction when possible. Yes, I really do this. I also shot the process using my GoPro camera and iPod Touch, making a stop motion gif. For each step, I would snap a photo and rotate the base the width of one LEGO stud. You can see the piece of tape with pencil mark at the at the bottom, where my finger pops in. There are 62 steps in the build. The first 55 frames of the gif above shows the build, I combined some smaller steps to save time. I did not really know how much it would rotate in the build. Since I finished before the full 360º, I showed the door open and close to finish the full rotation. Total frame count is 97. Marking the turntable, using a "LEGO T-Square"
Here is the interesting part. You can see the iPod at the top of the frame. I was just listening to it on shuffle, as I finished the build, the iPod was playing a track from the Back to the Future soundtrack. I did not think ahead to document the process of documenting the process. I tore down the set before I had a change to snap a few photos. Should have taken a before and after shot, but it is mostly there in the gif.